Junction Pool is our shortest pool, but it is also very productive and is responsible for many fish caught each season. The pool changes quite a bit each year, as the gravel bars shift due to flooding and ice melt. The borders are very important here – the pool is quite short but in low and medium water one of our best spots. The border to the beat below (not our beat) is marked by a stake on the gravel bank about half way down the beat. Please be conscious of the border, and reel in before your fly is fishing below the border marker- which splits the pool in half. Generally, the lower the water gets, the better it is. 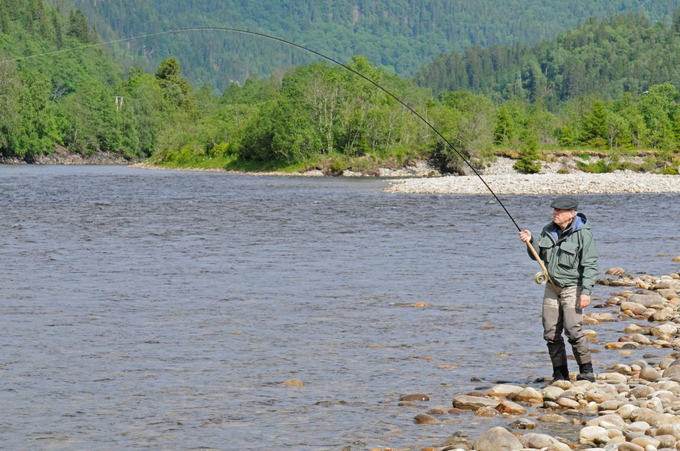 We recommend fishing this beat at medium and lower water levels. In high water start as high up as possible- wade out into the riffle, as close to the island in the middle. Be careful, the current in the left channel (white water) is really strong even though it looks shallow. 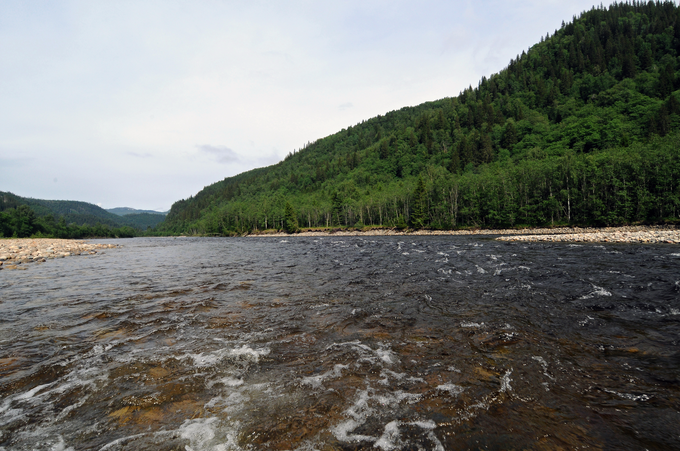 Use a sinking line and cast square, make an upstream mend, and try to let the fly sink down. In high water the pool is reduced to a short section of fishable water until you reach the lower border (the marker pole on the gravel bank). 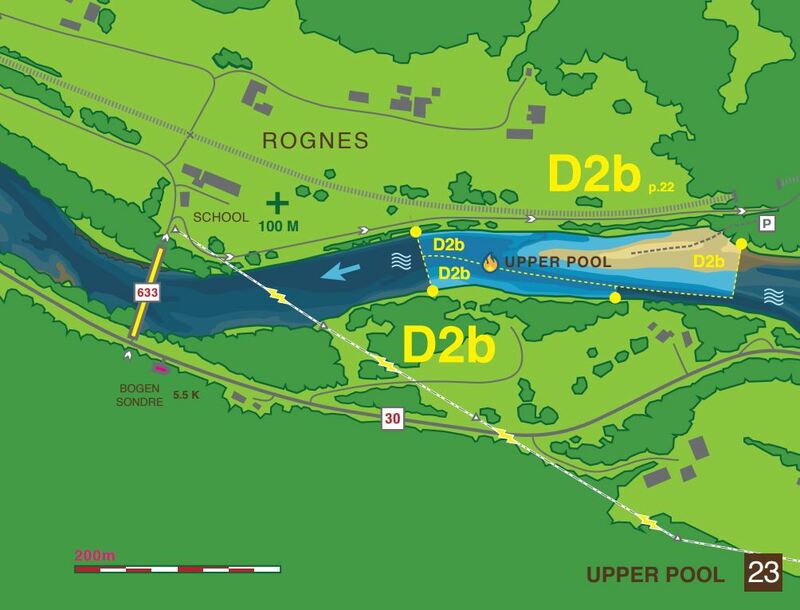 But in higher levels, as Bua Bridge Pool is also a part of D2 rotation- one can fish both pools during the same session. The water is still quite fast in this water level, but the pool gets better and better the lower it gets, so fish with sinking or floating lines with heavy sink tips (easy to mend). The best part is at the lower border- just above the border the water creates a mirror- and that is the place where the fish usually take. Respect and courteousness towards the fishermen below is quite important when fishing this pool. As we “share” this beat with other fishermen- one might talk to them and ask that they start fishing a few meters higher up and one can fish a bit further down, so all can fish the prime taking spot. But regardless, do not fish the water below the border. Fish this pool quickly, try it 2 or 3 times then change to one of the other beats in Beat D2 (Upper Pool or Bua Bridge) and maybe come back after 3-4 hours, you will have plenty of time during a 6-hour session. This is when Junction really begins to fish its socks off! Start now just below the island, where the two river branches meet- as this is one of the hottest spots in the river at this water level!! Try to cast to the outer channel and mend the line upstream- trying to hold it a while in the middle. The best part is the 30 meters above the border. Here is a beautiful taking spot around that glassy mirror. Try with floating lines then maybe change to sink tips and try different methods. 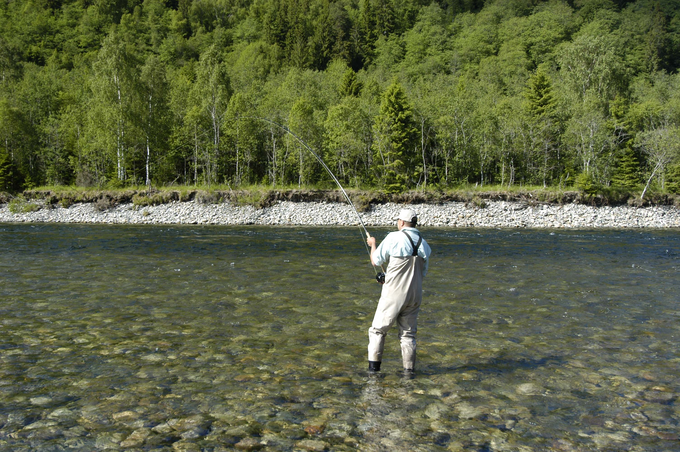 Cast as close to the other bank as possible, fish often take in the first third of the swing. Fish it 2 or 3 times through then move to beat D2 Upper Pool or Bua Bridge. 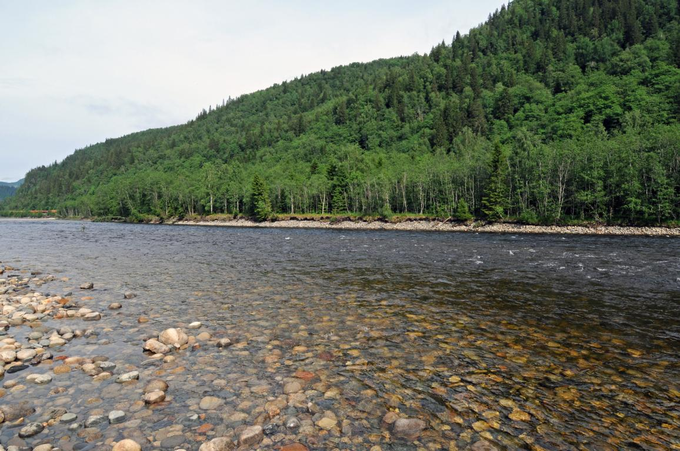 The other option is to fish the Beat from the right bank (past Beat C1: Long Pool- upstream) – but as it is quite challenging to reach and climbing down to the water is not easy- fishing from this bank is only for physical fit and adventurous anglers. You should talk to NFC staff or guides if you plan on fishing over there.